Diverticulosis is a disease affecting the digestive system which causes the formation of pouches (called diverticula) in the bowel wall. This condition tends to affect the large intestine and/or colon but also occurs less commonly in the small intestine. Diverticulitis meanwhile is slightly different and describes what happens when the diverticula get inflamed. This can then cause considerable pain and other symptoms. Stress is known to cause many different health conditions due to the intense strain that it places on the body. Among these is diverticulitis. Here we will look at the connection between diverticulitis and stress and how to treat them. The symptoms of diverticulitis include abdominal pain in the lower left quadrant along with stomach tenderness, fever and an increase in the white blood cell count. In some cases diverticulitis can also cause nausea and diarrhea, or might alternatively have the opposite effect and lead to constipation. The severity of all these symptoms can vary depending on the severity of the infection and on any complications. Rectal bleeding is one more of the less common symptoms. While it is more common for abdominal pain to be felt in the left lower quadrant, it can also sometimes be felt elsewhere, such as on the right. Diverticula are less common on the right side. The precise cause of diverticulitis is not fully known. The condition is thought to be 40% genetic with the other 60% being the result of genetic factors. Obesity is a risk factor and it is possible that diets low in fiber might also cause diverticulitis. It is also more common in the elderly as compared with younger patients. Some theories claim that avoiding nuts and seeds can prevent diverticulosis from developing into diverticulitis but there is no evidence to support this. What is known, is that stress can cause an inflammation of the diverticula resulting in diverticulitis. Stress is well known to disrupt digestion and many other systems in the body. The reason for this is that the body believes it is under physical attack from an outside threat and thus responds by directing more blood and oxygen to the muscles and the brain – and away from the immune and digestive systems. This is one of the reasons we get butterflies when we are stressed and it’s also why heartburn is commonly associated with stress. 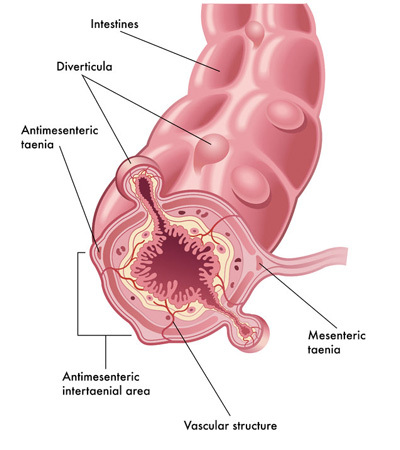 For those with diverticula, it’s possible that that the withdrawal of blood and oxygen from the digestive system allows the diverticula to become inflamed resulting in diverticulitis. Normally diverticulitis can be treated with bowel rest via a low residue diet. This low fiber diet gives the colon a chance to heal. Antibiotics can also be used if it is suspected that diverticulitis is caused by bacterial infection. In some rarer cases it may be necessary to perform surgery. Diverticulitis is will only be an issue for around 20% of those with diverticulosis. By maintaining a healthy diet, avoiding weight gain and avoiding stress, it may be possible to reduce your risk of developing the inflammation. To combat stress you should of course limit your exposure to stressors. This means taking breaks from work, going on holidays when life gets too much and not accepting more commitments than you have the time and energy for. At the same time though, stress is also about the way you deal with events and the way you interpret them. Cognitive behavioral therapy is a type of therapy that teaches the psychological tools you need in order to develop a healthy response to stressful events and to avoid letting it have negative effects on your health.